Corruption in Washington is nothing new. Lobbyists for special interests have been padding the pockets of amoral politicians for longer than most of us have been alive, and they've been doing so with the help of a controlled media that rarely presents the facts without shrouding them in terms of "left" or "right" in order to confuse people. But as you'll see in this story, the corruption goes far deeper than most people realize, and a perfect example of this is the dishonorable legacy of Nevada Senator and U.S. Senate Majority Leader, Harry Reid. Reid was recently exposed for accepting large sums of money from Big Pharma in order to craft and guide the recently-passed health care bill in Big Pharma's favor. Again in 2007, Reid made the same top ten list. This time, according to a report in the Los Angeles Times that year, Reid abused his power in Washington to negotiate a lucrative real estate deal for developer Havey Whittemore. The same report explained that Whittemore had contributed "tens of thousands of dollars" to Reid's campaign, and hired Reid's son, Leif, to act as the company's lawyer in order to "negotiate" the deal with federal officials. There are likely other historical scandals involving Reid, but these should give you a taste of the type of activities in which you might typically find him engaged. (And you may want to check out Judicial Watch for yourself to see who else is on these lists; you might be surprised to see that politicians from both sides of the aisle regularly appear there). But the biggest issue I want to bring to your attention is Harry Reid's open and obvious connections to Big Pharma, particularly in relation to the recent health care bill. This is perhaps the most damning and far-reaching scandal in Reid's history yet, illustrating just how powerful Big Pharma is when it comes to controlling Washington for its own gain. Last summer, Billy Tauzin, then President of the Pharmaceutical Researchers and Manufacturers of America (PhRMA), visited the White House to work out a deal on the health care bill. Mind you, PhRMA is the largest single-industry lobbying group in the nation. According to reports, he negotiated with government officials to make sure all existing drug industry favors would remain intact in any proposed health care legislation. But this wasn't all. Tauzin was able to convince Democrat politicians - many of the same ones who promised during the Obama campaign to rid Washington of special interest control - to add to the bill additional drug industry perks including subsidies, mandates, and a complete monopoly on complex drugs that will last 12 years. So much for transparency and reform, huh? 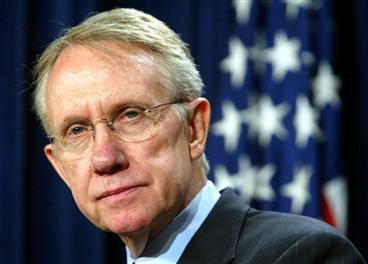 So how does Harry Reid play into all this? Reid successfully stopped Byron Dorgan's drug reimportation amendment from being added to the bill, which would have helped to reduce drug costs for consumers (and cut Big Pharma's profits). The Dorgan amendment was basically a government price control option that would have reduced drug prices for consumers and limited Big Pharma's complete monopoly over drugs. Even though it was a far cry from a true free market that would lower drug prices through real competition, the amendment would have cut costs for consumers, employers and states at the expense of Big Pharma's monopoly. Nevertheless, Big Pharma quickly squashed the amendment through one of their right-hand men, Harry Reid, who coordinated a Democratic filibuster of the bill until PhRMA could convince the politicians who supported the amendment to change their minds. One of the ways PhRMA achieved this was by convincing the Department of Health and Human Services (HHS) to write a letter to the Senators who were about to vote on the bill. Throughout this entire process, Reid was the primary catalyst for guiding health care reform legislation the way PhRMA wanted it to go, and in the end, he made sure it got passed the way Big Pharma wanted. A far cry from actual reform, the health care bill drastically expanded Big Pharma's control over health care under the guise of being a "public option". It's important to note that Sen. Harry Reid, a Democrat, and Sen. Richard Burr, a Republican, hold the top two positions on Big Pharma's political donation payroll. Both political parties, you see, are deep in bed with Big Pharma. Naturally, the passage of Obamacare has sent shock waves throughout the nation, including in Harry Reid's home state of Nevada. Reid's support for re-election dropped tremendously in his home state following the passage of Obamacare, with approval ratings hovering in the 30 percentile. Fortunately for Reid, part of Big Pharma's payment for his services includes funding an ad campaign for his re-election this fall. One of the ads they've made for Reid (below video) includes laud and praise for the many supposed ways that he's helped Nevada families and improved the condition of the state, but the ad was bought and paid for by, guess who? PhRMA. It's exactly this type of apparent corruption in Washington that the Obama campaign spoke so heavily against on the campaign trail. But in its actions, the Obama administration wholly supported handing Big Pharma even more monopolistic control over America's health care system. This type of doublespeak seems sadly typical in Washington, and it comes from both parties. Sadly, both the Republican and Democratic party have been largely hijacked by pharmaceutical interests, and until we get the corporations out of politics - and the crooks out of Washington - this situation is unlikely to change.